A vocation is a gift from God. A vocation to the Clerics Regular Minor(Adorno Fathers and Brothers) is a particular call of God to place one's life at the service of the Church, according to the charism of our Founders. Membership in our community affords men the opportunity to serve God through parish work, missionary activities, retreat work and teaching. As a family, we strive to share with one another the joys and sorrows of everyday life. Our Order is open to those who are called by God to embrace the religious life. As religious, the candidate may pursue the life of a priest, brother or permanent deacon. Formation with the Clerics Regular Minor begins with the period of postulancy.During this time, a candidate is helped to cultivate his baptismal grace, to discern more clearly and with greater certainty his own vocation, and to acquire the virtues and develop the attitudes for following the call of the Lord. A one year novitiate is the second period of formation in our Order. 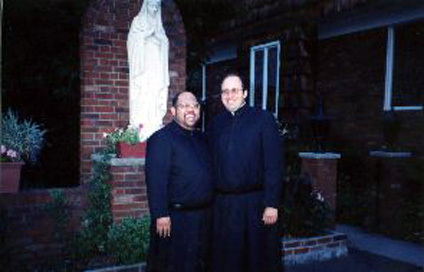 It is a period of grace and trial, during which the novices deepen more clearly their knowledge of their vocation in our Order, and experience its style of life.In the novitiate, the vows, the Constitutions, the spirituality, the purpose and the history of the Clerics Regular Minor are well treated, so that the novices may know and live our charism, which should be the soul of their religious life. Upon completion of the novitiate, the candidate professes the religious vows of chastity, poverty, obedience and not seeking after ecclesiastical honors. This simple or first profession lasts three years. During this time, the professed religious deepens his spiritual life in the Order and also become involved in some apostolate in our parishes. Solemn Profession is the highest and most complete expression of consecration to God in the service of the Church, and of full aggregation in our religious family. It is the sign of the spousal love that indissolubly unites Christ to the Church, his spouse.